Umair sent me a link to a post he just published on his SEO Advice and Social Strategy blog voicing his concerns about Google’s Personalized Search Results. Congratulations, Umair. You are one of the few whose mind still works well enough to clearly see the consequences of allowing one monopoly to determine what you see and know about. Few realize that what the general public sees and hears has long been controlled by those who own the media. Although there is an illusion of an impartial media with differing viewpoints, what we see is really only polarized versions controlled by the same people. Divide and conquer is the oldest strategy in the playbook. Spinning the information to create the most dissension so the two sides are unlikely to share notes – and all the while never telling the entire truth to either side. 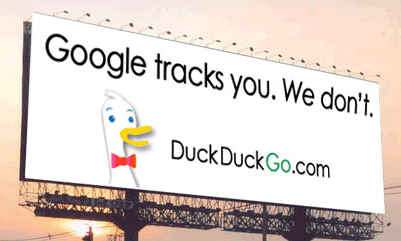 Google tracks you - DuckDuckGo.com DOES NOT! tell all the cleverly created disinformation from any truth some may write? and others instead of ONLY using Google. We need to collectively research alternative search engines and compile the information. If you have posts or lists or details please feel free to add them to the comments here. Related links ARE welcome and although comments with many links will go to moderation I manually approve them. DoFollow links and attribution will be provided for all who contribute. Image Credit: SEOMOZ.org ~ Click this image to read their excellent post Google's Un-Personalized Search. Tools to Hack the Code. 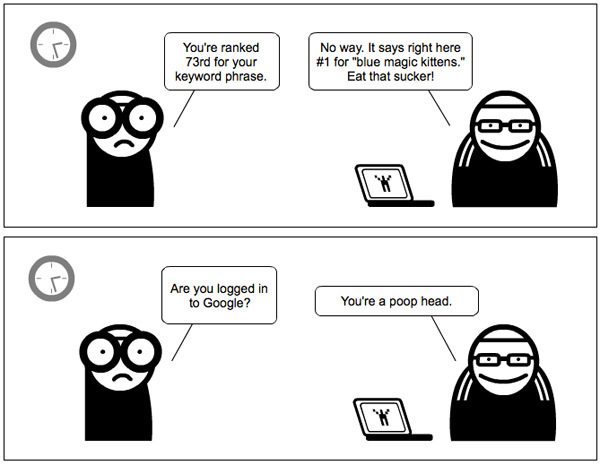 SEOMoz ~ Google’s Un-Personalized Search. Tools to Hack the Code. Third, we must all SAVE the urls to sites we find valuable because they are already being pushed further and further down in the serps and eventually they are likely to disappear altogether. And lastly, seek out the blogs of others in your physical location and in the niches of the most important topics you research. Interact with them in the comments. IMPORTANT: Exchange MANY different methods for contacting each other because your Twitter or Facebook or Google+ account can be easily made to disappear – taking with it all your contacts – UNLESS you have saved them in alternative ways. and on anyone who uses SEO for organic results. The most brilliant SEO agency owner I know – Marty Weintraub @AimClear – just published a post about Organic Keyword Tracking on SEO Survival in the Age of Vanishing Keywords that illustrates yet another way Google IS Evil. I’m unhappy with the noises Google are making, not only with their search engine but also regarding Android, and making it less open, but that’s another story.. I think Google has become everybodies pet hate……. and to be honest they desrve it, more annoying is they still continue on blindly without listening to its users. I would like to thank Ana for her contribution that has given me something to put into action immediately. Guys, google is the world greatest search engine! They have a “monopol” and they think, what they do is “right” or “ok” and now body can control them. How I hate this with Google, always drives me crazy. I search for something at home and next time when I am at my g/f and want to find the same thing nothing is in the searches…yakkk. From my experience, no hacking is necessary, Gail – all you need to do is open an incognito window in Chrome (here are directions: or private browsing in Firefox. Since most of our target audience is still on Google, that’s where we’ll have to be – until something changes. Ana would love you to read ..Banner Advertising: Viable Make Money Blogging Solution? Ana, I checked out your post on how to open an Incognito window. Right on. I added the comment that Google Chrome has a pulldown menu (the little wrench icon) that let’s one do that without having to remember the command. As I mentioned there, I don’t want Google to be offended at how creepy I think they are. I for one extend a hearty welcome our new robot masters. Duck duck go.com is true better but carry on is tougher than new product. Just read a basic point on this at umair’s blog there i found your link in the comment as trackback and opened it . I read here full and just got in the depth of this subject. thanks so much. I really think to use different search engines too But the thing is we are used too of Google. You got that right. Google is personalized some times key words are not working.you write something you see something..I will try duck duck go.com. Google is a classic example of the old saying “absolute power corrupts absolutely”. Google feels it is free to do anything it pleases …. scary stuff. I am thankful for other search engines. I agree that we need to engage more with the sites that we like so that no matter which search engines or social sites are around in the future we can visit and support the ones we like. With that said, the truth right now is, google is big, like it or not. We have to work with them to get the most that we can. In short, Google is accessing our privacy? That’s kind of nasty.. I’ll try switching to DuckDuckGo.com, thanks for the share! This is very and i could even find a lot of blogs who has little to almost zero comments because they think that most of the people who leaves a comment are spammers. Every blogger should learn how to use these spams to their advantage and create an interactive community. I had no idea Google did that. I’m glad I know now because I was wondering why I could search Google and my results would be different from a friend. I just thought they randomly changed within seconds. anyone remember blekko.com they did it befor Google! Google guys just copied them. Lately, I have been more and more upset with the personalized searches! Even if I am logged of all things Google, they are still capturing my city and state and then the results are skewed by what is close by! I sometimes forget and it takes me a bit to refocus and pick another city! I often am doing a general search and do not want to necessarily only see what is close by! Becoming more and more personalized until it is scary! I would like to know when “google” became a verb ??? As is “just google it” or “I googled the definition of …” So many people are accustomed to utilizing G they completely forget there are other search engines out there. It seems like Google is control the whole internet and pretty soon our personal lives. I mean, they do have lots of great tools, but you are right, there are other search engines as well. But sadly, as long as we all just rely on Google, Google will have the upper hand and will do what they want. Like it or not, search engine power will stay the same for a good while. 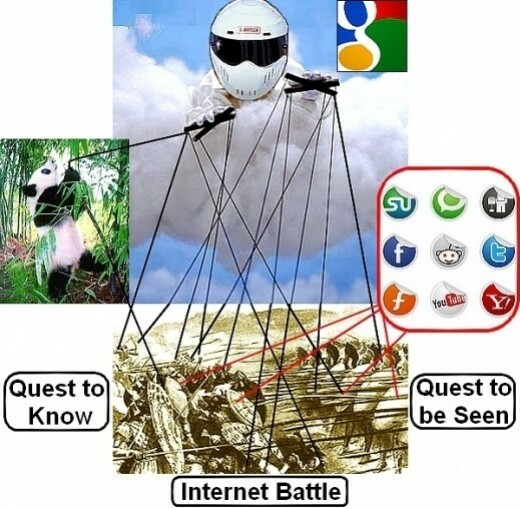 Realize that many people are still learning the ‘internet’, some (if not a lot of) people see google as “internet”. It’s all about mentality and how people adjust with the web technology. Furthermore, most of the system logic is automatic and “brain-dead” and by that I mean, there’s no little geek dude on a computer reading your search entries. Someone who’s open to open-minded technologies that bring people together. Oh, off-topic: I reminded about several posts about people being afraid of google knowing what you search. Well, what do you have to hide? If you’re a killer who’s searching for best ways to kill someone, the police might have some interest in your little search query. And if you want to “hide” the fact that you ordered a secret present for your girlfriend, trust me, google will not call your girlfriend. One view of the Danger of Corporate Monopolies as applied to the railroads and Microsoft gives some insight into what could happen. Few realize that the reason it costs more for goods to be trucked WITHIN the state of Texas than it costs to send them to any other state is because of the power of the railroads STILL HOLD to regulate prices. 1) You might be at the wrong place at the wrong time and have a crime pinned on you that you didn’t even know happened. 2) Products you innocently purchase can be ASSUMED to be used for illegal purposes, so just having bought them on your “loyalty” card or the data saved because of how you paid for it could make totally innocent people LOOK guilty and end up in jail – again for something they don’t even know about in the first place! 3) People are VERY GOOD at jumping to incorrect conclusions about what something means. Someone who reads a lot might just be curious so what you read does not PROVE you are ANYTHING – but many will sincerely believe that if you read X book that means you are whatever that book is about from gay to bigoted to a criminal to crazy. What is socially acceptable now may not be years or decades from now. When I was young smoking cigarettes was socially acceptable. Today it is not. Next year it could even be illegal. Since everyone knows that smoking is addictive, if there is a record of you smoking – or buying cigarettes (which might not have even been FOR you), or photographs of you smoking – and it becomes not just socially acceptable but illegal anyone who EVER bought or smoked cigarettes could be ostracized or even arrested. To all those who are going to claim that is over the top I suggest they speak with some of the few people still alive who survived concentration camps. Ask them why they didn’t leave the country when others were being rounded up. Then remember THAT is the reason for all the quotes related to “those who refuse to remember history are destined to repeat it”. If you don’t think that could ever happen to you I have one thing to tell you: you are very naive. I am glad that you brought this up. I have been thinking ways to improve my online business and I think I should try this up. Thank you. I thinks that’s the pretty much awesome that the Google become smart and the competitiveness for rank increase and that also increase the price for SEOs. The only thing Google really has going for them is that the media made them ‘the’ one-and-only search engine by suggesting we “google” things in everything from the evening news to movies to prime time TV to soaps to newspapers and magazines. Any company that gets touted in every form of major media becomes “the” company. With that much power, influence and backing they can afford to build and give away what they please – and how can any small business compete against free? One day we will wake up and realize that free is never free and what those so-called Free Services are REALLY Costing Us. That is the reason for the common saying “There is NO Free lunch”. Google is quite intelligent and it has no competitor in long run.I always get what I want from this search engine. What many do not realize is WHY they believe “Google….has no competitor in the long run” and “I always get what I want from this search engine”. Most people who say things like that don’t even know there ARE any other search engines or whether the results they get are biased or not. Yes, many people are blinded by what media offers them. They tend to believe everything they see, which is exactly the media’s agenda. Nice cartoon! It’s true Google controls too much of everything . I don’t really blame them for the power they have to control business, information, jobs and everything else. It just happened that they where the ones who obtained this kind of innovative ideas. The thing is that there will be no way to adapt where this is leading. Big brands will have all the business; small businesses will be gone; and eventually we will be left with one company store that only takes vouchers you earn from slave labor in their sweat shops. The piece of the puzzle that most are missing is that these multi-national corporations are “competitors” is pure illusion. The same few wealthy control them all and they all have the same agenda. The sooner people open their eyes to that truth the more likely we can slow or even stop our descent into the abyss. It is up to each person to decide whether they will declare their freedom or give it up bit by bit. The Google unpersonalize is pretty awesome. I’ve been mostly using Scroogle but this sounds like it may be a better option. One thing to remember about unpersonalized is that it isn’t if you’re logged in to anything Google. Compare the results you get when you log out to what they are when you’re logged in and you’ll see what I mean. All of us MUST continually raise awareness of the dangers of automatically giving Google all the search traffic. Until we take that away from them they hold an axe over each and every one of us who depend on traffic online for our living. It’s too bad that those who have the power always end up abusing it for business, you kinda made me sad with all this truth 🙁 but thanks for providing the duckgogo link i’m going to read about them right now. Great points! From an SEO perspective, we should anticipate and compensate for the rise and fall of search engines. Yahoo declined so quickly that we should also be prepared that Google could do the same. And it seems their downfall could be caused by their ubiquity and the abuses of power that comes with this. Thanks for the reminder! That is simple. Just watch for media to change horses. Once they promoted Yahoo and overnight they switched to Google. Once they went on and on about MySpace and overnight they switched to Facebook. You don’t need a crystal ball to know who they’re backing, but remember that the same people control EVERYTHING they back so switching from Google to Yahoo! to Bing is almost meaningless as is switching from MySpace to Facebook to Twitter to Google+. The few control them all. The only real difference is using independent alternatives and if they get bought out or done in be prepared to switch horses yourself – to the next independent alternative that is closest to what you want. Try to select those that won’t sell out – but remember that sometimes they aren’t given a choice so if they get taken over for any reason be ready to ride. growmap would love you to read ..Buddy Can You Spare a Dime to Help My Friends? Imagine how much easier it will be to polarize the average person on the issues and divide and conquer when all someone can find is what agrees with their current viewpoint? Wisdom comes from intentionally seeking out ALL viewpoints to determine where the Truth lies. Anyone who only reads those who agree with their point of view lacks common sense and will never get to any Truth or become wise. It is up to US as bloggers and leaders to educate our friends, family, peers, clients, etc. about alternative search engines. We have enormous major media conditioning to overcome and the one thing that CAN overcome it is the trust gained through personal relationships. I totally agree with what you are saying. I have actually tried getting people to use bing more and nobody in my household uses Google. We need to create some diversity and stop Google from have all the control. The problem is when you ask people about the internet the only websites they really know about and remember is Google and Youtube. There isn’t much discussion among friends and family of smaller and less well known websites even though the quality of information can sometimes be a lot greater. I am going to be writing a post on this matter within the next few days and come up with a list of more exiting and fresh search engines. To try and show people that Google isn’t the only one out there. I will be sure to link back to this page to show my readers where I got my inspiration from. We have had many such search engine launches. Just checked DuckDuckGo.com and it looks decent. the searches were fast and yes, i can say personalized too.. Thank you for sharing the tips gail! i really appreciate it! Thanks Gail for making my point much clear and conveying my message to a large audience. I still remember, the most fascinating thing about the internet for me was to see the other side of picture which helped me a lot to reach the actual facts behind many ideas, thoughts and incidents. But, I guess internet marketing giants doesn’t want that anymore. They want me to put in my place where I will never really able to believe that people around the globe are just like me and their is nothing really different about me and them. The religion and political differences are not that much as I saw them in my society and what my elders told me. This post was a response to your Why is Google Blocking Knowledge post and my post today For Bloggers Who Hate Comment Spam is also for you. As Far As Im concerned everything gets corrupted. Its not necesarrily a bad thing just a evolitionary step .. I think the internet is the biggest thing to happen in my life time and it is the information age. So no wonder google walks the line of commercialising access to information ….. I agree that most people just throw in the towel and take corruption for granted. That does NOT have to happen. There ARE some of us who choose ethics over greed. Not everyone can be corrupted. Being corrupt is a CHOICE people make. We can choose NOT to accept corruption and to boycott all companies that do evil. It is NOT easy. There are often major drawbacks to doing it. Look how far the U.S. has already fallen into the gutter. If some of us don’t hold the line it will get even worse. I for one refuse to accept immoral actions as “unavoidable” – that is simply an excuse made by those who don’t have the guts to stand up against the overwhelming current of wrong overtaking us. Google IS Evil. By choice. Period. So is Google and Automattic’s Akismet using crowdsourcing to silence us. You’re a victim of Akismet now – and that is usually what it takes for those who accept corruption to change course if they ever will.